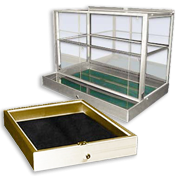 Showcase your jewelry pieces with our countertop display cases, perfect for any store or trade show! Shop countertop stands made of acrylic, aluminum, glass or wood and unique rotating displays & metal T-bar stands. Exhibit any kind of jewelry, from earrings, bracelets to necklaces, rings & chains. Get the best deals thanks to our wholesale prices!